Florence (Italian: Firenze; Tuscan: Fiorenza) is a city in Italy that was home to many famous artists who flourished during the Renaissance, including Leonardo da Vinci, Michelangelo Buonarroti, and Raphael Sanzio. 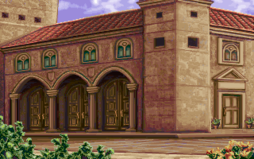 The area of Florence that Mario visits after traveling back in time is noticeably weathered but still grand, with marble pillars holding up scuffed buildings. In Mario's Time Machine, he first goes to Florence in the year 1505 after Bowser steals Leonardo da Vinci's Notebook, although Mario does not know that the Notebook belongs to Leonardo. He questions the locals, including Michelangelo, about the owner of the book and, once he learns of the owner's identity, he promptly enters Leonardo's workshop to return it. Mario leaves Florence once he successfully gives back the Notebook. Later, he travels back in time to the year 1503 to return Michelangelo's Chisel, which had also been stolen by Bowser. 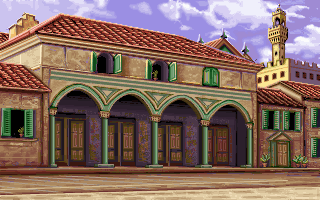 He once again questions the locals, including Raphael, and takes his leave again once he visits Michelangelo in his workshop and gives his Chisel back to him. This page was last edited on April 15, 2019, at 04:23.